Mountain Dew is a popular carbonated drink made by PepsiCo. 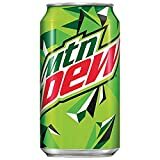 What surprises many people is the level of caffeine in Mountain Dew - at 55mg it is significantly higher than Coca-cola. The drink comes in a multitude of flavors and serving sizes and special editions. 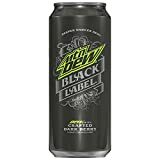 Some editions of Mountain Dew have more caffeine, so check them in our database here. *Versions with more caffeine than original MD. Previously, in several countries outside the US, Mountain Dew contained no caffeine. However, it was reported that in the beginning of 2012, places like Canada now sell caffeinated mountain dew as the principle product. Canada used to have a regulation that prevented the sale of non-cola sodas containing caffeine. Within the US and elsewhere, PepsiCo does make a caffeine-free version. 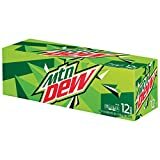 Besides caffeine, Mountain Dew contains a high amount of sugar. In fact one 16 fl.oz. bottle of Mountain Dew has more sugar than 2 Snickers candy bars. 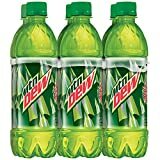 (Regular Mountain Dew) Carbonated water, high fructose corn syrup, concentrated orange juice and other natural flavors, citric acid, sodium benzoate (preserves freshness), caffeine, sodium citrate, gum arabic, erythorbic acid (preserves freshness), calcium disodium EDTA (to protect flavor) and brominated vegetable oil, yellow 5. 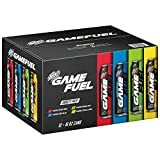 Mountain Dew contains 4.50 mgs of caffeine per fluid ounce (15.22mg/100 ml).